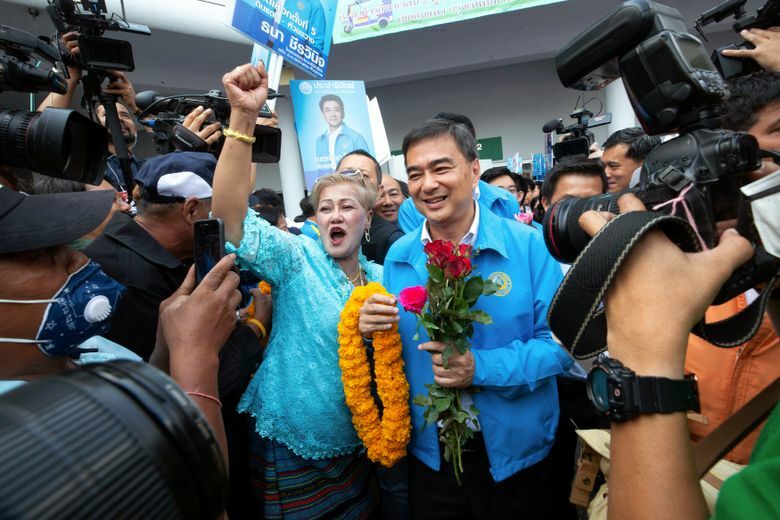 BANGKOK (AP) — Candidates in Thailand’s first general election since the military seized power in 2014 began registering Monday, as supporters waved banners and chanted slogans in political activity that until recently was illegal. Hundreds of candidates from dozens of parties crammed into an indoor stadium to officially enter the race and draw lots for the numbers that will go alongside their names on the ballot papers for the March 24 election. The Thaksin-associated Pheu Thai Party’s main challenger is expected to be the Palang Pracharat Party, widely considered a proxy for the military. “Yes, we will be among the parties who get the most votes,” said Palang Pracharat’s secretary-general, Sontirat Sontijirawong. Following the election, Palang Pracharat is expected to nominate the head of the current military government, Prayuth Chan-ocha, to be the next prime minister. Prayuth, one of three candidates the party has proposed, was army commander when he led the 2014 coup that ousted an elected government formed by Thaksin’s sister, Yingluck Shinawatra. Pheu Thai’s top pick for prime minister urged the state Election Commission to keep a close watch on the polls. Prayuth’s chances of remaining prime minister are considered good because of elaborate rules for forming the next government. There are 350 directly elected seats in the new lower house, but another 150 are decided through a complicated system of proportional representation that, roughly speaking, deals out seats in inverse proportion to those a party wins in the constituency vote. The more of the 350 seats a party wins in the direct vote, the lesser share of the 150 it is rewarded. The architects of the military-endorsed system say it will ensure that lawmakers are drawn from a wide range of parties, thereby bringing many voices into the chamber. Critics say the system is designed to keep any one party from winning a majority, forcing the creation of a coalition government. An earlier Thai constitution sought to discourage coalition governments to prevent wheeling and dealing in which parties sold their loyalty for Cabinet posts, which perpetuated a political spoils system. Also, when the newly elected lawmakers meet to choose a prime minister, they will be joined by 250 unelected senators. The senators, who like the military are part of the traditional conservative power structure that opposed Thaksin, almost certainly can muster enough votes to appoint the army-backed candidate. Under the constitution pushed through by the military, a prime minister does not have to be an elected member of parliament, again reversing earlier constitutional provisions. “The military has the advantage of having 250 senators in their hands and they still can deploy all the state mechanisms in favor of the party that supports them,” said Chaturon Chaiseng, a leading member of a party allied to Pheu Thai. Pheu Thai’s ability to block the junta’s candidate will likely depend on it forming an anti-military coalition. The well-established Democrat Party could be the key. But its antipathy to Thaksin runs deep. Its leader on Monday offered little likelihood of an alliance. “It’s up to how Pheu Thai evolves but if they cannot step out of the shadows of the Shinawatra family . obviously we cannot work together,” said Abhisit Vejjajiva, a former prime minister.